Our new exhibit, The Trust Family Foundation Shark and Ray Touch Tank, gives visitors a great view of a simulated mangrove ecosystem in the 25,000 gallon main tank, and there's also a live red mangrove exhibit. The term “mangrove” refers to both individual species and entire plant communities. Many of these species are unrelated, but they all share similar adaptations to living in salty water, low oxygen, and exposure to wind and waves. There are at least 50 species of trees and shrubs called mangroves. Individual species form habitats collectively know as mangroves. Mangroves are found along tropical and subtropical coasts of Africa, Asia, Australia and the Americas. The closest mangroves to us are in Florida, Texas, Louisiana, the Caribbean and Central America. The four species in the Americas are red mangrove, black mangrove, white mangrove and buttonwood. You can read about a research trip by Aquarium scientists to mangroves in Belize here and here. Mangroves thrive in intertidal zones of sheltered shores, islands and estuaries. They grow in soft shoreline sediment and have specialized root structures that increase their stability. 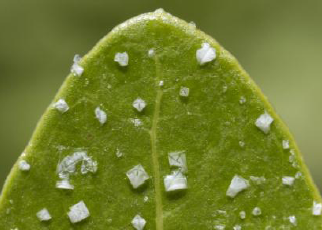 They can grow in soils that are too salty for other plant species because some species have specialized root membranes that exclude salt and some species excrete salt from glands on each leaf. 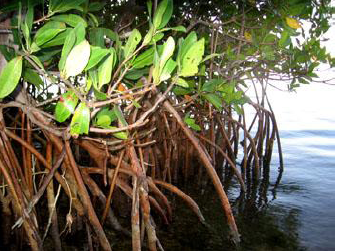 For shoreline protection: Complicated networks of mangrove roots absorb pollutants and prevent coastal erosion. Seagrass beds and coral reefs depend on mangroves to maintain water quality and clarity. In areas prone to hurricanes and tsunamis, mangroves save human lives and property by reducing wave velocity by up to 75 percent. For habitat: Many birds, fishes, reptiles, mammals and invertebrates use mangroves for foraging, roosting and breeding. One study has suggested that up to 80 percent of commercial fish in South Florida began in mangrove nurseries. In addition, many species of sharks, some similar to those in our touch tank, spend their early years among the safety of mangrove roots. Climate change: Mangroves are carbon sinks and play an important part in the global climate by absorbing carbon dioxide from the atmosphere. Mangroves are also carbon sources. When disturbed, the soils in which mangroves grow can release carbon back into the atmosphere. Habitat loss/coastal development: As coastal human populations increase, mangroves are cut down to make room for urban expansion. In many countries, mangroves are considered “wastelands” and sacrificed for new residential areas, coastal resorts, roads and canals. Seafood aquaculture: Mangroves are converted to artificial shrimp ponds to meet world shrimp demand. Often large and unregulated, these ponds displace native species and release large quantities of animal waste into surrounding areas. Pollution: Herbicides and other pollutants damage plant and animal species. Oil spills coat mangrove prop roots and prevent oxygen uptake as well as negatively affect birds, sea turtles and other animals. Come see the goosefish egg veil! It's that time of year again. Boston is showing signs of spring and the Aquarium's goosefish has laid another long whispy veil of eggs for visitors to see in the Northern Waters Gallery on the third level. Goosefish, like the one in this exhibit, release these long masses that float along in the water, while the eggs develop and hatch little goosefish larvae. These egg veils can be 60 feet long, 3 feet wide and contain 1 to 2 million eggs. The Aquarium's goosefish tends to lay an egg veil every year. Here's the post about last year's egg veil. Visitors photographing the egg veil. The goosefish resting at the bottom of the exhibit. The egg veil will remain in the exhibit for the next couple of days. It's another great reason to come to the Aquarium tomorrow. Not only will you be able to preview The Trust Family Foundation Shark and Ray Touch Tank from 11 a.m. to 3 p.m., but you can see this egg veil up close. Male sticklebacks build a nest by attaching tying together vegetation using secretions from their kidneys. Once the nest is complete it attracts females, who lay their eggs in it. The males then chase the females away and fertilize the eggs. Studies have shown that males build multiple nests, so be sure to keep a look out on your next visit. You might just see a builder at work! Here are the answers to some of the most common questions about these rays. Cownose rays, like other stingrays, have a stinging barb on their tail that they use to protect themselves if they are threatened by other animals. 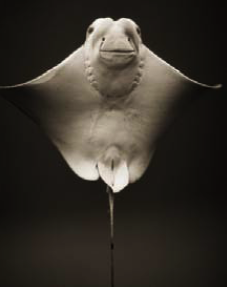 It is very unlikely for a person to be stung by a cownose ray since they don't spend much time on the sea floor. Most people get stung by accidently stepping on rays that are hidden in the sand. Although rays are not aggressive, all the rays in the touch tank and in our Giant Ocean Tank have had their spines clipped back as an added precaution. What do cownose rays like to eat? Rays have multiple rows of flattened teeth to help crush things (kind of like a nutcracker), such as shells of clams, mollusks, and crabs. They also eat shrimp, bony fish and other bottom-dwelling organisms. 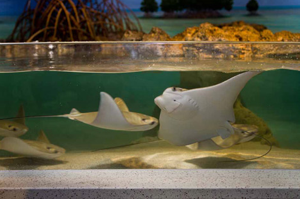 Where do cownose rays live? Cownose rays are migratory and can swim great distances. Tens of thousands of cownose rays can be found schooling in large groups in warm temperate and tropical waters along the western Atlantic coast, between southern New England and South America. They are especially abundant in the Chesapeake Bay during the summer months. Do cownose rays lay eggs? Rays are ovoviviparous, which means that the egg develops inside the female and remains there until it is ready to hatch. After a gestation period of about 11 to 12 months, a single pup comes out tail first with its wings folded over like a crêpe. Cownose rays generally begin reproducing at the age of 7. The cownose ray is listed on a global scale as “near threatened.” In U.S. waters, cownose rays are not directly targeted by fisheries and their population appears to be thriving. In the Central and South American parts of this species’ range, however, the cownose ray is more at risk due to intense and generally unregulated fishery activities.